With the presence of a large pool of participants, the global electronic access control systems market is displaying a highly competitive business landscape, finds a new research report by Zion Market Research (ZMR). Bosch Security Systems, Honeywell International Inc., Cisco Systems, Siemens AG, and Panasonic Corporation are some of the key vendors of electronic access control systems across the world. These players across electronic access control systems market are focusing aggressively on innovation, as well as on including advanced technologies in their existing products. Over the coming years, they are also expected to take up partnerships and mergers and acquisitions as their key strategy for business development, states the electronic access control systems market study. In a key product offering witnessed across electronic access control systems market, in August 2018, Allegion U.S., a global security products & services provider, declared to have launched a new version of Keri System software that will support Schlage locking system in the no-tour operational mode. Reportedly, this month ADT Inc., a U.S. firm offering electronic security & other alarm monitoring services to small businesses and residential sector in 35 countries, announced the buyout of Access Systems Integration, a U.S. based firm that offers robust & comprehensive security to customers through integrated Access Control Systems. Analysts predict that the strategic move will help both the firms to expand their product portfolio and customer base along with enhancing their technological prowess. As estimated in this report, the global electronic access control systems market stood at US$ 20.49 billion in 2017. 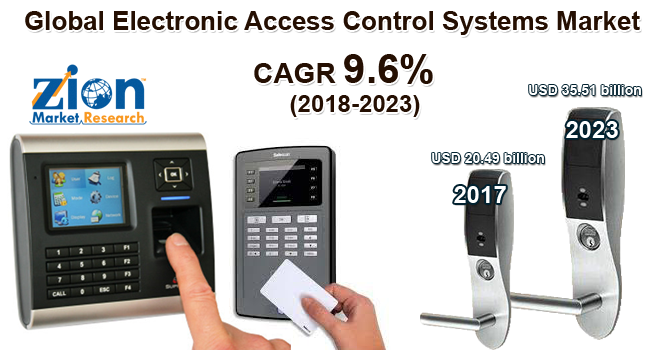 Witnessing a tremendous rise during the period from 2017 to 2023, the revenue in this electronic access control systems market is expected to reach US$ 35.51 billion by the end of the forecast period. The key systems available in this electronic access control systems market are authentication system, perimeter security system, and intruder alarm system. “Rising demand for improved security services across residential, industrial, commercial, and government sectors is likely to boost the growth of electronic access control systems market over the coming years,” says the author of this electronic access control systems market study. Apart from this, rise in the criminal activities, thefts, burglary, and other threats to private as well as public property will further boost the demand for the electronic access control systems. The rising cost of system installation, however, is projected to obstruct the growth of the business sphere in the years to come. Regionally, Asia Pacific has been leading the worldwide electronic access control systems market and is anticipated to continue on the dominant position in the years to come, states the electronic access control systems market study. Rapidly surging consumer base, escalating demand for electronic surveillance, and improved standards of living is the main factor behind the dominance of the Asia Pacific electronic access control systems market. The enhanced acceptance of EAC systems in various organizations based in the region is another significant factor that is supporting the growth of this regional electronic access control systems market.